Doesn't she remind you of someone? Whenever, in my blog, I venture beyond matters sartorial toward what is considered political, commentary from readers picks up dramatically. It almost seems as if there is a rightist media watch at work, chiding critics of the neo-cons—almost a cultural equivalent of U.S. Border Watch, that intrepid brigade of amateur volunteers who guard our Southern border with binocs in one hand and Lone Stars in the other, from the vantage of strategically placed lawn chairs. Angry commentators claim that they want to read what I have to say about style, and such vital matters as collar stays and wingtips, but should I veer toward the realm of politics, or even ideas, they not only protest but suddenly question my modest gifts of observation and charge me with blathering. In fact, it is in no small part matters of style that have occasionally led me into political critique. Style is a consistently reliable “tell” as to the hand being played in politics. I was raised on Marshall McLuhan, and the idea that the medium is the message is part of my intellectual DNA—it’s against my nature to winnow content from form. It’s not just what you say, it’s equally how you say it. In fact, I believe that what you say is how you say it. The ideas George W. Bush have expressed overtly haven’t been particularly shocking, but the seemingly scrambled and mangled words that have delivered his ideas reveal an alarming subtext of obscurantistism. His individual slips are amusing on the surface, but in sum these confused messages constitute an attack on meaning itself. And the chief executive lowering the bar of intelligibility so profoundly is no joke. The very concept of style begins in words. Style is the particular way we express our individual character, whether in writing, speech, or dress; and there is indeed profound meaning in the manners by which politicians express, comport, and garb themselves. With the surprise choice of Sarah Palin as the Vice Presidential candidate on the Republican ticket we encounter a candidate with a style never before seen in these exclusive precincts. 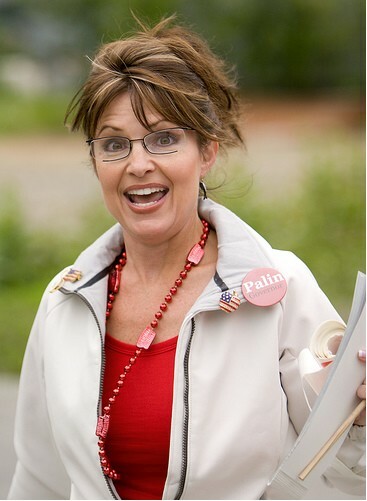 Palin’s style came as a shock to some, a delight to others, and a perplexing mystery to me. The eminently seasoned politico Bill Clinton seems to actually admire Sarah Palin’s style—maybe it was the red, white, and blue bikini—and he has risen to her defense on style points alone, surprisingly arguing against those on the left and right who are aghast at her selection for the ticket. "I come from Arkansas,” said Clinton, “I get why she's hot out there." Notice his choice of adjective: hot. Apparently the Eastern European heads of state Palin photo-opped with recently found her hot, too. Let’s not forget that she won Miss Congeniality in the Miss Alaska beauty contest, and Miss Congeniality is a title that requires both beauty and, well, congeniality. And the phenomenon of Sarah Palin is about more than meets the eye. A definition of congeniality is “having the same tastes, habits, or temperament,” and it seems that Palin has been chosen precisely because she is congenial to the masses; she shares the tastes, habits and temperament of a significant portion of the mass electorate. She's one of the gang! Sarah Palin represents a radical seismic shift in political strategy. Once leaders were chosen for being the best and brightest—we sought out orators, strategists, polymaths, and geniuses to lead us. Today our leaders may be chosen for their representation of American average and for an utter lack of distinction. It is part of the campaign against the intelligentsia, the quiche-and-arugula-eating, Chardonnay-sipping elite. Because of profound changes in the structure of mass media—a shift from the literate world of newspapers to the sound-bite world of cable TV—we have a different sort of democracy today. We now have TV-driven elections and we are discovering that they are very similar to TV programs that involve voting, such as American Idol. But Sarah Palin is the genuine article. She didn’t have to work to be ordinary; she was born that way. And she is so ordinary that she represents a sea change in American politics. She is the ultimate political candidate for a political system that resembles American Idol. She is far closer to Clay Aiken than she is to Hillary Clinton. What is proclaimed as her strength and virtue is her very averageness: a local beauty contest Miss Congeniality, a mother married to a working stiff, a newcomer to passports who doesn’t live in a McMansion, who hunts and fishes and minds the kids, while somehow juggling chief executive duties the way other moms juggle PTA duties. Somehow her ordinariness and lack of distinction and achievement are now considered to be a key manifestation of the democratic ideal. Palin’s principal qualification is that she realistically represents the masses. The pitch selling her qualification is that the failures of Washington are attributable the educated elites. To achieve real democracy we need someone who is ordinary in every way, someone the little people can identify with, someone who hasn’t been tainted by Harvard or foreigners. Palin is presented as not particularly gifted, educated, wealthy, or beautiful, but as entirely genuine. Her utter averageness is her greatest strength. 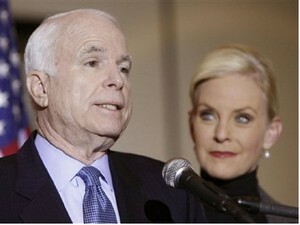 So to pick on Palin is to pick the American people. The Republicans are traditionally the party of the moneyed elite, and through perhaps the smoothest bait-and-switch in history, they continue to serve this constituency covertly while descrying their actual agenda. Posing as the party of the people, the party of patriotism and supporting the troops, they have forged an unholy coalition of the religious, the gun-toting, the xenophobic, and the resentful white silent majority, railing against big government while quietly inflating it. By appealing to the fears of the great middle they advance the agenda of the ultra-elite super-wealthy. But with Palin they have kicked their posture up a notch, adopting the ultimate faux-populist stance by suggesting that the leadership of the extraordinary is a failed idea, and that true democracy is achievable only by giving the absolutely average their shot at running things. And in a masterstroke of re-positioning they have recruited this paragon of puppetry to charm the masses. If the Republicans manage to win, Sarah Palin, as Naomi Wolf has suggested, will likely play Evita to cancerous old McCain’s Juan Peron, ready to step in and do the work of righteousness in a moment of loss or crisis. And, lo, she comes from the promised land! In Palin’s evangelical world view Alaska is the refuge where the righteous will seek comfort when the End Times are upon us. Palin is a great believer in what they call American exceptionalism. She is a candidate positioned to appeal to those who believe that America has a special destiny, like its best friend Israel. It is the promised land of the chosen people. And now the Republicans have revealed a great and profound irony: that Americans are exceptional because they are average and unexceptional. Indeed, God moves in mysterious ways. As do Republicans. They have learned that Americans don’t want to be led by a charismatic genius sprung from the educated elite, they now want a surrogate in office, someone just exactly like them. Bush, for all his wealthy upbringing, finally achieved mediocrity through his own determined efforts. But Sarah Palin is a natural; she was the genuine article from the get go. She’s that hyper-determined hockey mom, an over-achiever who feels a special destiny, eerily similar to Nicole Kidman’s murderous newswoman in To Die For. But Palin is an even more special case because it was God himself who put her up to it. And though her resume is unremarkable, it is clearly untainted by the elites. She is something entirely new. She is the chosen prole who embodies the mystical hand of destiny in manifest destiny America. And while the intellectual snobs of the liberal elite may seek to ensnare Sarah, faulting her for her lack of experience or knowledge, they will not be able to trap her so easily by her words because her words are utterly indecipherable, even inscrutable. What is she saying? They can’t make it out. She seems to be contradicting herself but it’s hard to say for sure because even she doesn’t know what the hell she said. She seems to recite by rote but in her playback she scrambles and encodes it, creating a sort of Gordian gestalt inaccessible to the literate. But if the media doesn’t understand what she says, the people do, apparently. Because she speaks their broken language. It’s body language and patented catch phrases so charged with emotion, if not precise meaning, that they are positively ionized. Who needs literal precision when you’ve got the vibe. Bush’s slips and malapropisms seem comic—“putting food on your family”; “we look forward to hear your vision”; “people that had been trained in some instances to disassemble—that means not tell the truth"; “we will stand up for terror…” But Bush’s gaffes are not simply the comic errors of a man who disdains academic grammar, elevated tone, and highfalutin usage in favor of the All-American vulgate; his style is a conscious deconstruction of meaning—the replacement of a language of precision by a language of ambiguity or even ruse. He found her in a bar! It’s not easy to achieve meaninglessness in the context of government and statesmanship. Palin goes beyond malapropism into a language of pure gibberish, into doubletalk that resembles the comedy of Professor Irwin Corey—who satirized the elevated jargon that academic elites employ to convey an impression of importance that is all flash and no substance. Palin’s syntax is not that of the English language, but a new kind of language in which conventional structure is replaced by blocks and stacks of code and buzzwords, pre-digested button pushing ideograms that simulate speech but are in fact its opposite. This new form of communication, more signifying that communicating, is not new. The neo-conservatives have been developing this code in the precincts of Karl Rove and Rush Limbaugh, but Palin is the new grand master of this radical, almost cubistic conservative brand of post-logical rhetoric. It goes beyond doubletalk, beyond doublespeak, into circumlocution combined with Burroughsian cut-up strategies; so that logical thought is short-circuited, and meaning can never proceed in conventional linear fashion. A sentence—or its equivalent—begins conventionally, but then, when the electrically charged key word is reached, it is as if a switch is flipped and a tangent kicks in, negating the previous logical track while appearing to complete it. In Palin’s discourse there are no actual diagrammable sentences. Instead the Governor speaks in sententious paragraphs of scrambled, cut up clichés, run-on sentences, and collaged clauses, stringing them together like signal flags flapping from a warship. Palin’s words and phrases don’t mean in the conventional sense. They are not ordered logically, but biochemically, forming a rhetoric of subconscious rhapsody. Her singsong tone is everything, and the phrases it beams are more lyrics than argument. Palin’s song is perhaps related to one of the fundamentalist religionists’ key practices, speaking in tongues. What does one say when speaking in tongues? Is it the Enochian language of the angels (or devils), or is it a signification of language that is in fact its opposite? One listens with a sort of horror as Palin simulates speech. Surely others recognize that this is not language as usual. Surely the interviewer knows! But then a suspicion begins to take shape, a suspicion that, to many listeners, this dance of words is recognized as meaningful speech. It doesn’t conform to any of the rules of grammar or logic, but it serves as an acceptable substitute for those to whom grammar and logic are not essential in communication. I wonder what interlocutors like Katie Couric or Charles Gibson really think and feel when listening to this performance, when they recognize that their interviewee is completely perplexed in the face of their questions, either entirely baffled or unprepared to respond. But then correspondents such as these are prohibited from freely questioning the nature of her mode of response for fear that they will be characterized as biased elitists and/or sexists who misunderstand and disparage the folksy colloquial style of the Alaskan governor. But what if she is not dissembling in this mishmash of hers? What is it she is doing when she speaks in cut-up tongues? What if she is invoking avenging angels using Aleister Crowley’s parsing? What if she is summoning Baal and Beelzebub? The Vice President is the first person in the presidential line of succession. 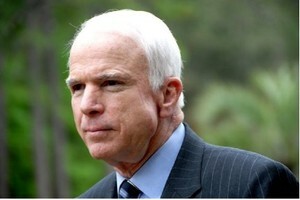 Responding to criticism of John McCain for saying, in the midst of the banking crisis, that the economy was fundamentally sound, Palin responded: “Well, it was an unfair attack on the verbiage that Senator McCain chose to use.” Undoubtedly she was unaware that verbiage means “a profusion of words, usually of little or obscure content.” It is a common mistake made by those trying to sound important, trying to elevate their tone into something resonant with seriousness. But Palin was correct. McCain is a veritable font of verbiage, a coiner of trite phrases and a cryptologist who uses words that say one thing while suggesting quite another. But as a practitioner of verbiage, Palin doesn’t have to take a back seat to anyone. She pours out catch phrases stripped of the connectors. Finally white people have a signifyin’ monkey of their own. Henry Gates defined signifying as employing tropes that have been memorized in an act of communication and its interpretation. And Palin’s rhetoric is a jumble of tropes designed to grab the audience with a shock and awe of confusion. Imagine a Tourette’s syndrome of euphemism. Nothing is what it seems. Nothing is, finally, nothing. Democracy is still new and it is, we must realize, highly experimental. It is not a fixed thing but an elusive, ephemeral concept that changes as the way people communicate changes. We possess, it is said, a government of, for, and by the people, and yet our lives are still ruled by secret intelligence agencies and mysterious forces like the Federal Reserve and bizarrely named, inscrutable institutions like Fannie Mae and Freddie Mac—titanic economic forces that sound like almost like the nicknames bestowed by George W. Not to mention the vast network of networks we call the media.